My favorite part of making this comforting strata recipe is that you prepare it in the evening, so that all you need to do in the morning is place it in the oven. It’s a perfect entrée for any breakfast or brunch gathering. But if you want, make this sumptuous egg dish all for just you. (I do!) Freeze individual portions of it, then simply heat it up in the microwave in the morning for a calorie-friendly breakfast—in just a minute. Enjoy! In a (PFOA-free) nonstick Dutch oven or large deep skillet, melt the butter with the oil over medium-high heat. Add the potatoes, onion, and rosemary and sauté until the onion begins to caramelize, about 8 minutes. Stir in the vinegar. Add the spinach a large handful at a time and toss using tongs until wilted, about 2 1/2 minutes. Add ¼ teaspoon of the salt and, if using, the nutmeg and toss to combine. Set aside. Evenly arrange half of the bread pieces in the baking dish. 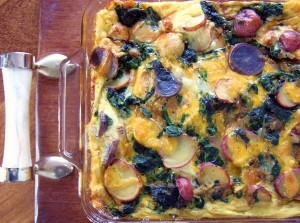 In order, evenly top with half of the spinach-potato mixture, half of the cheeses, and the remaining bread pieces, potato-spinach mixture, and cheeses. Drizzle with any remaining liquid from the Dutch oven. Whisk together the eggs, almond milk, pepper, and the remaining 1 teaspoon salt in a large bowl and pour over the layers in the baking dish. Cover and chill overnight (at least 4 hours) in the refrigerator. Remove the strata from the refrigerator and remove cover. Preheat the oven to 375°F. Bake until the strata is set, about 55 minutes. Let stand for at least 5 minutes, and serve. Grease a 3-quart baking dish with butter (that’s left on the butter wrapper). In a large skillet, melt the butter over medium-high heat. Add the ham and onion and sauté until the onion is softened, about 3 minutes. Add spinach by the handful and sauté until wilted, about 2 minutes. Whisk together the eggs, milk, salt, pepper, and nutmeg in a medium bowl. Arrange half of the bread cubes in the prepared baking dish. Layer on top half of the spinach-onion mixture and half of the cheese. Layer on top the remaining bread cubes, spinach-onion mixture, and cheese. Evenly pour the egg mixture over the layers while pressing the bread cubes slightly to assure they’re fully moistened. Cover and chill in the refrigerator overnight (at least 4 hours). Preheat the oven to 400°F. Bake uncovered until the bread is lightly browned and eggs are set, about 50 minutes. Let stand for at least 5 minutes to finish the cooking process, and serve.